Have you ever watched some of the races in the Olympic Games and wondered why the athletes don't all start from the same part of the track? It is called a "staggered start". If they all started from the same line, then the athletes in the outer lanes would have to run further than the athletes in the inner lanes, because of the semicircles at the top and bottom of the track. So each lane has to have a special starting position so they all have to run the same distance. How far does each athlete run when he/she completes one lap of the track? Let's look first at the route followed by the runner in Lane 1 (the inside lane). And together the two curved parts make a circle of radius 36.8m. See the page Circle to learn more about radius and circumference. Wow! The inside lane is exactly 400 m.
Well, that is how it is designed. But What About Lane 2? Can you complete the following table? 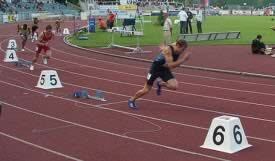 You should have found that the runner in Lane 8 starts about 53 meters in front of the runner in Lane 1! It's fair because, with the staggered start, each athlete runs exactly 400 meters. But some people say that the athletes in the inner lanes have an advantage because they can see the other athletes, and know what work they need to do to catch up. On the other hand, others argue that the athletes in the outer lanes don't have such tight curves to run. So, unless all races could be run on a straight stretch (like the 100 meters), it will never be totally fair. You might want to investigate the area of each lane (imagine you want to paint them different colors). The area is made up of the circular area and the straights. We don't want the athletes running position, we want the radius of the edge. And the area of both straights = 2 × 1.22 m × 84.39 m = 205.9 m2 (to one decimal). You can do the rest! Will the areas be different? By a little, or a lot?